Vladimir Ilich Lenin (1870–1924) led the first successful revolt against market-based liberal democracy and founded the Soviet state in 1917, serving as the new nation’s chief architect and sole ruler for the next five years. He created an innovative political, economic, social, and cultural system that in its heyday would challenge the military, technological, and cultural might of the United States. 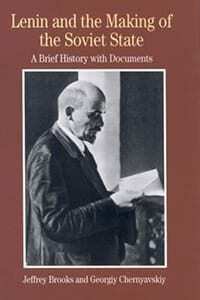 This collection of primary sources allows readers to learn about Lenin through his own words and explores the complicated relationship between Lenin’s actions and his ideology. Jeffrey Brooks and Georgiy Chernyavskiy have translated newly available documents that make it possible to provide a more accurate portrait of this ruthless strategist. Document headnotes, a chronology, questions for consideration, and a selected bibliography offer additional pedagogical support and encourage students to analyze the actions and beliefs of a man who transformed world history and whose legacy continues to affect social and political movements throughout the world.